ice cream at noon: congratulations Jenn & Brian! 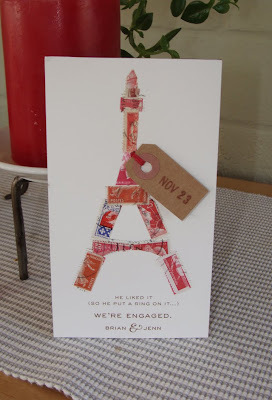 My good friends, Jenn & Brian got engaged in Paris a few weeks ago. I received this delightful engagement announcement in the mail today. Crafted/designed by my pal, Jennifer Teixeira. thoughts and inspirations from a graphic designer & mom who has recently been transplanted from NYC to Norwalk, Connecticut.